I read this article and found it very interesting, thought it might be something for you. 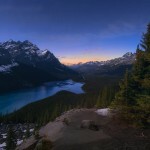 The article is called Top things to do in Banff National Park – Canada Travel Guide and is located at https://capturetheatlas.com/top-things-to-do-in-banff-canada/. A visit to Banff National Park, Alberta Canada will make you believe in love at first sight. The sublime nature of the mountain peaks, the dreamy lakes, and the abundant wildlife will conquer your wild heart. Banff will probably be your first contact with the Canadian Rockies and I am quite sure that there is no better place to start your Rockies adventure! 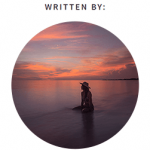 In this travel guide, we will tell you about everything there is to do in Banff Canada, so you can be prepared to make it the trip of a lifetime. But before moving on to the guide to Banff National Park, let’s take a brief look at the main attractions in Banff. Banff Spring Hotel: Visit the Upper Springs of the Fairmount Banff Springs Resort, one of the first Banff hotels located near hot springs. 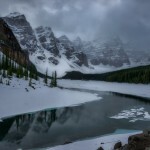 Moraine Lake: This lake is a must see in Banff, although its access is cut off during the winter. Lake Louise: Without a doubt, this is the most touristic lake in Banff. Although it is always crowded it is a place you can not miss in Banff. Minnewanka Lake: In summer remember to go in a group as it is an area frequented by Grizzly bears. 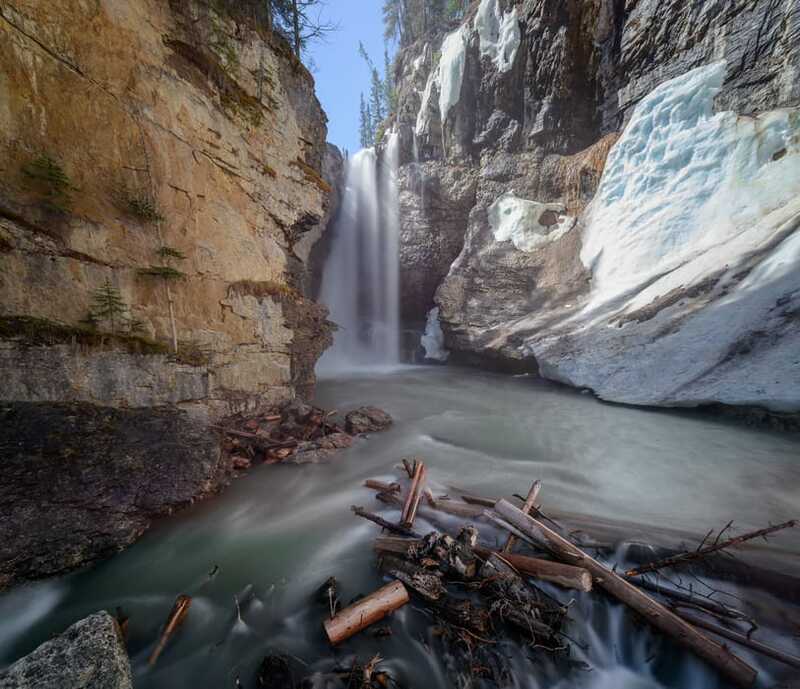 Johnston Canyon: In this canyon, there are two waterfalls and those who make the complete route are rewarded with one of the best views in Banff: The Ink Pots. Bow Valley Parkway: This road between pines is the best place to see wildlife in Banff. Peyto Lake: Touring the Icefields Parkway you will pass through this lake with the shape of a wolf’s head. Mistaya Canyon: Enjoying the glacial waters that have carved this canyon is something you have to do in Banff. Banff, the oldest national park in Canada, is located in Alberta. 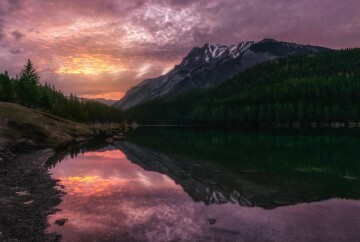 It is one of the four national parks that form the Canadian Rocky Mountain Parks – through the Icefields Parkway to its north is Jasper National Park, to its west is Yoho National Park, and to its south, is the Kootenay National Park. Considering all the National Parks of the Canadian Rockies, I would dare to say that there are more things to do in Banff than the rest of the parks. Lakes, ice fields, canyons, waterfalls, glaciers and mountain ranges full of wildlife create the perfect environment for all kinds of adventure activities. 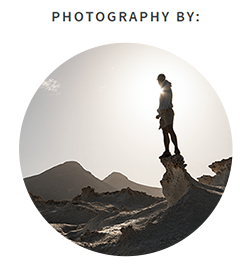 Camping, hiking, kayaking, wildlife encounters … You can take the adventure for granted! We traveled to the Canadian Rockies for 15 days, 6 of which were spent in Banff, though not consecutively. Rather, we visited two separate times, once at the beginning and once at the end of our trip. 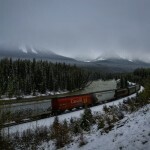 There are different ways to get to Banff, as you will find in this article. The easiest way to get to the Rockies is to fly to the Calgary airport, which is only an hour and a half away from Banff. This accessibility makes Banff the most visited of all four parks that shapes the Canadian Rockies. Most travelers fly to Calgary, pick up their rental car or camper, and go into the mountains. Once we got our car, we bought the necessary supplies and mountain gear for our trip before heading to the Canadian Rockies. Although we took most of our equipment from home, fuel for the camp stove and bear spray are important things that we bought at the Calgary MEC store. You can also find a very useful post (written by us) about things you need to bring on an adventure like this here. 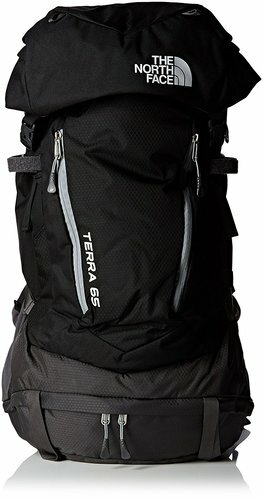 In general, Canada is expensive, so I would suggest to bring as many things as you can instead of buying them in Calgary, or even worse, in the Rocky Mountains. Once you enter the national parks, prices rise exponentially. Here is our budget for this 15-day Canadian Rockies trip if you are interested in estimating expenses. Once we got everything ready, we set off for the best travel experience of our lives. Another option is to get to Banff from Vancouver. 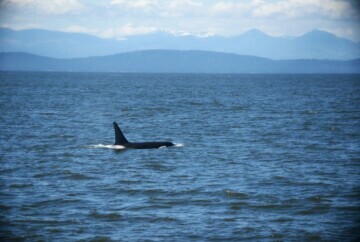 In addition to visiting Vancouver, you can take a whale watching tour with this itinerary. It takes 9 hours by car from Vancouver to Banff, so we decided to take a cheap flight from Vancouver to Calgary instead, and booked it three months in advance. 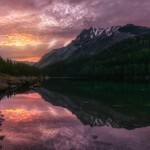 If you decide to visit Banff and Jasper on your Canadian Rockies trip, you should know that these two national parks are connected by the Icefields Parkway, one of the most popular scenic roads in Canada. I recommend that you travel between Banff and Jasper both ways via the Icefield Parkway (a 4-hour drive), since the road itself is one of the best attractions of the Canadian Rockies. Standing in the Rockies for the first time is a compelling experience. You cannot help but be surprised along the 80 miles road that takes you across Banff national park. Our time in the Rockies was limited and we had no choice but to leave Canmore out of our plan. This town is in the first that you will pass on the way to Banff when driving from Calgary. There are many interesting activities to do here, but we decided to head directly to the heart of Banff. Throughout this travel guide, we will discover all the essential places you cannot miss in Banff National Park. 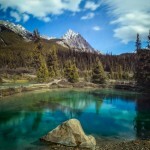 We will especially emphasize the best scenic hikes in Banff, of which will leave you breathless. And of course, we will tell you about the places of interest and tours to do in Banff National Park. Banff. The most populated town in the park and in the Canadian Rockies. Your visit is essential not only for the different hiking maps available in the Banff Visitor Center but also because there are amazing places in the surroundings. Bow Valley Parkway. A narrow road bordered by thousands of pine trees that you will want to drive through again and again. 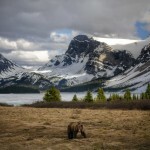 In addition, it is one of the best places to discover the Banff wildlife. Lake Louise and Moraine Lake. Possibly the most touristy places in Banff. 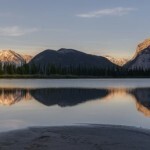 These lakes are the main attractions of the park and likely in all of the Canadian Rockies. Icefields Parkway. The most beautiful road in the world that crosses glaciers, ice fields, lakes, alpine landscapes, canyons, and waterfalls. It is the link between Banff National Park and Jasper National Park. We will also talk about lodging (mostly campsites)inside Banff National Park where we stayed, as well as a compilation of the best Banff hotels. 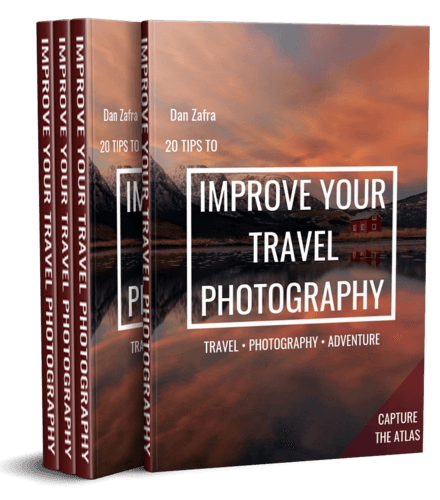 Finally, we will give you some tips, including a few that has been discussed in the Canadian Rockies post, which I recommend reading before this article. Banff is a good place to start your trip across the Canadian Rockies. It is the largest town within the park, although still small since all construction and development are under tight control considering its location inside the national park. In addition to a wide range of accommodation, there are shops, restaurants, bars, and mountain equipment stores. However, the most interesting place is the Banff Visitor Centre, where they provide the maps and guides you need for your tours and hikes. 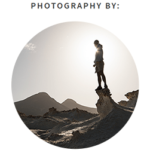 Specifically, you can get the Day Hikes in Banff Area Guide. You can also find it attached here. The first thing I recommend doing in Banff is camping at Two Jack Lakeside Campground for at least one night. Imagine a summer camp on the shore of a lake, stories around a bonfire and the fresh smell of pine when you open your tent in the morning. This was our base camp for exploring other places within Banff National Park. We spent two nights here and were lucky that the changing weather of the Rockies gave us a summer day and a winter one in the month of May. 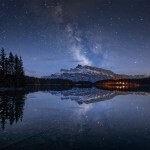 It is also essential to take a night visit there when the Milky Way crosses Mount Rundle. Another phenomenon that you have to see in Banff, is to get up early enough for sunrise to see the alpenglow tint the peaks in orange. 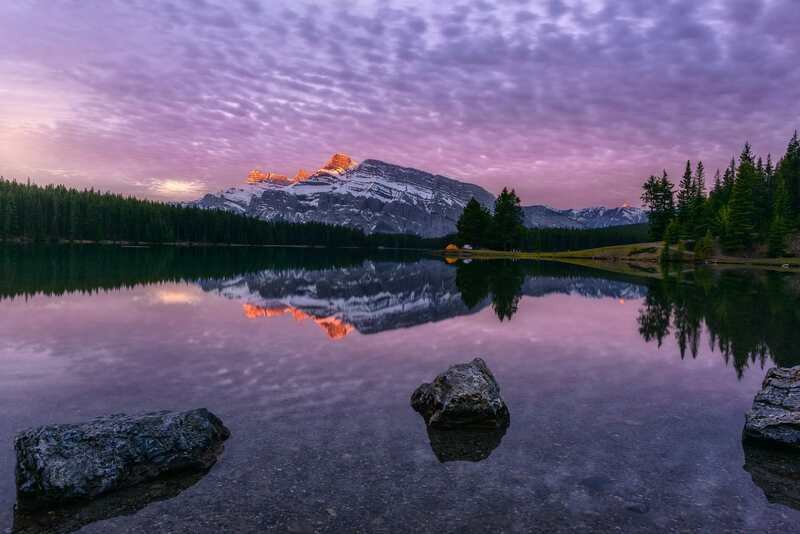 And while you are already up early, turn yourself and the tripod 180 degrees, and you will get an even better view of the sunrise over Minnewanka Lake. Two Jack Lake is nothing more than a smaller version of the imposing lake Minnewanka, impossible to cover at a glance. 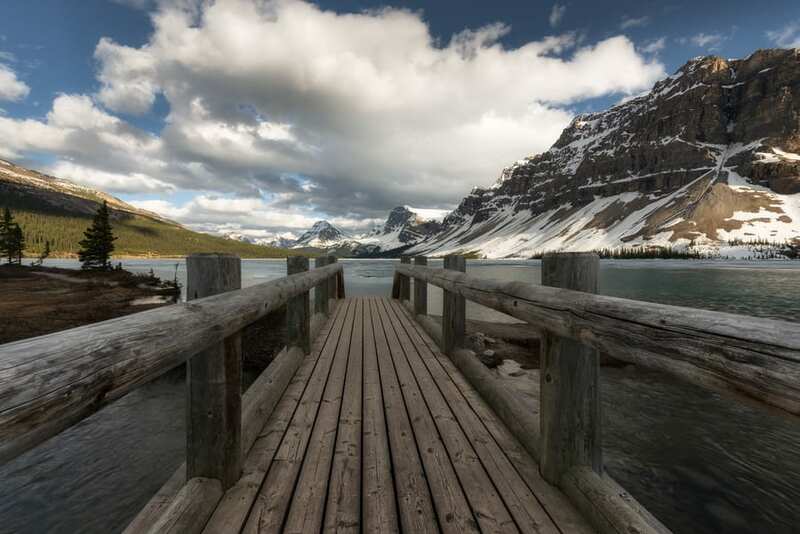 Some of the best hikes in Banff start at this lake. 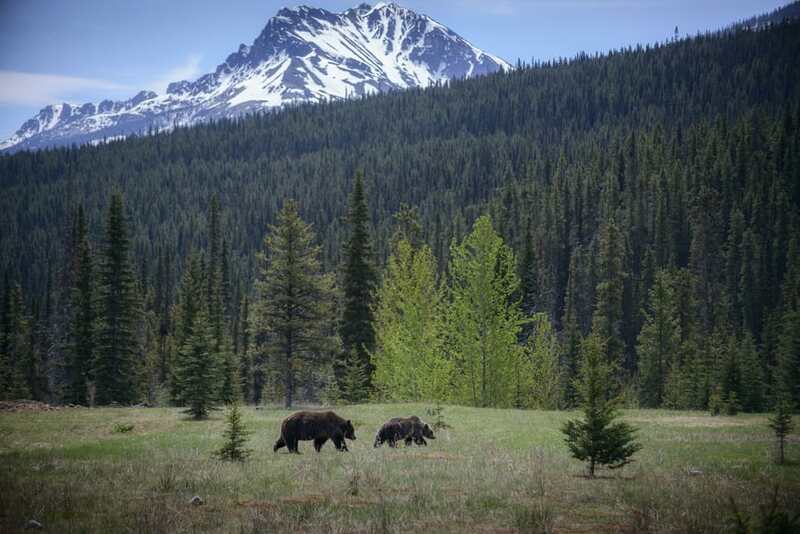 Note that for some of them, access is restricted during the Berry Season, (July 10 – September 15) when grizzly bears descend toward the lake to eat about 250,000 berries per day until hibernation. During this time, it is obligatory to hike in groups of at least 4 people and carry bear spray at all times. You can also learn how to prevent encounters and how to react (if it happens) in our guide to avoid bear attacks in Canada. We decided to do the Stewart Canyon hike, which is 1 mile long one way (40 minutes round trip). At the end of this hike, a much more complicated trail begins, at 7.3 miles one way (8 hours round trip) that takes you to the Aylmer lookout. We had to leave halfway when it suddenly started to snow. 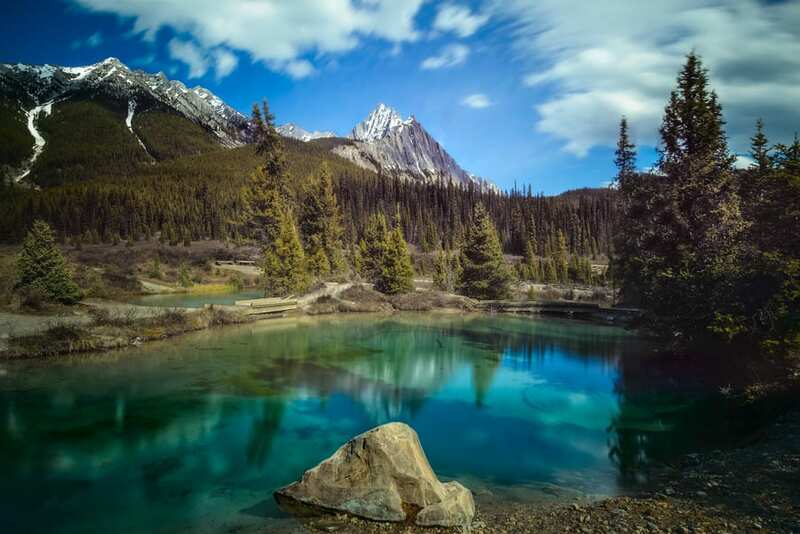 Another thing I recommend doing in Banff is to visit the Vermilion Lakes on the other side of the town. The best time to visit is at sunset. In the map of Banff below, we marked the best location to visit these lakes that is accessible by car. Also, if you like night photography, spend at least one night here. 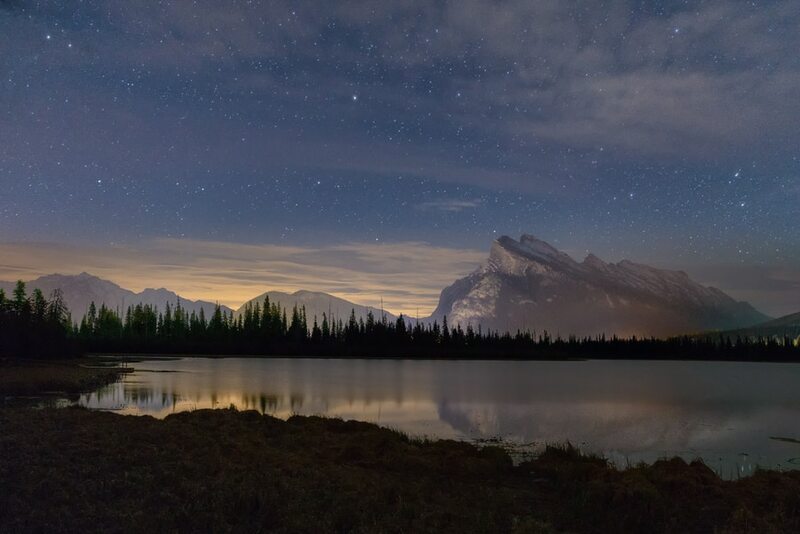 The night lights of Banff in the background will help create a nice glow in your compositions. Even though the Bow Valley Parkway seems like just a road, it is a real attraction and one of the best in Banff. It used to be the main road connecting Banff to the northern parts of the Canadian Rockies, but after the highway was built, the road was not used anymore and is now full of nature and wildlife, only used by visitors during spring and summer. For me, this is one of the most beautiful roads I have ever driven through. It is very narrow with many sharp turns, surrounded by thick pine trees and plenty of wildlife that will force you to drive slowly as you enjoy this scenic old road. If you want to know what animals you can find, do not miss our list of animals that live in the Canadian Rockies. If and when there is a storm, I recommend staying alert. While driving through, a huge pine fell a few meters in front of us and blocked our way. While you can always use the highway to get up north faster, the magic of the Rockies is definitely here, on this road that is full of life. One of the most popular treks in Banff National Park is the Johnston Canyon. There are two waterfalls in this canyon. The first is Johnston Canyon Lower Falls, an easy one hour round trip hike (0.75 miles one way) with only 90 feet of elevation. Many people visit this fall as it is easy to access. 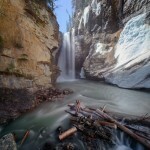 After the first waterfall, the path continues and takes us to the second fall, Johnston Canyon Upper Falls. The number of people decreased a lot on this portion, however, it is still an easy route to the fall, and can be reached within 30 minutes. What made us fell in love was the Ink Pots further up the hike, a must-see in Banff National Park. The hiking difficulty is moderate-hard. From the parking lot, it takes about 4 hours round trip, 3.3 miles one way with a vertical drop of 1080 feet. After passing the two main waterfalls, there were no other on the trail. In the Ink Pots, the spring water is tinted in turquoise and green, with a temperature that stays at around 39ºF throughout the year. It is a real show to witness, and that makes the last steep section of the hike totally worthwhile. After finding hot springs there, Banff National Park was formed during the construction of the well-known Canadian Pacific Railway, which aimed to unite the east and west coast of Canada. As they discovered the wonders hidden in the mountain ranges, the railway company decided to advertise using the Rockies as a tourist attraction and started building several hotels, resorts, and spas in the Banff area. Nicholas Morant, a photographer who worked for the Canadian Pacific Railway, popularized this section of the road with his photographs that were used in different promotions of this train line. 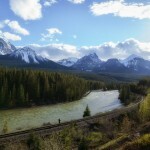 Morant’s Curve is located on the banks of the Bow River. To find it, follow the Bow Valley Parkway until you almost reach the town of Lake Louise. There is no sign, but you can check the location on the map below. The desired perfect shot happens when the train passes through the curve. However, this is not an easy task since only two trains pass each day and without a fixed schedule, so taking this picture home is a matter of luck rather than preparation. 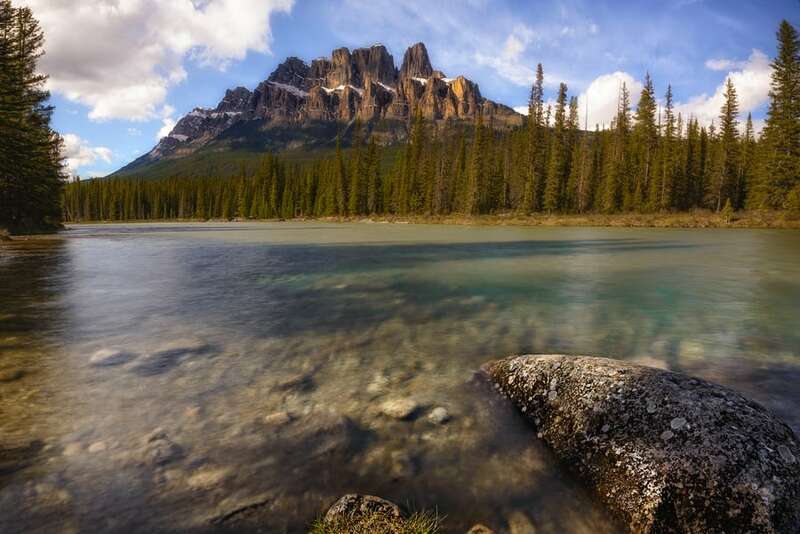 One of the most impressive but lesser-known sights from the Bow Valley Parkway is the one on the opposite bank of the Bow River looking towards Castle Mountain. 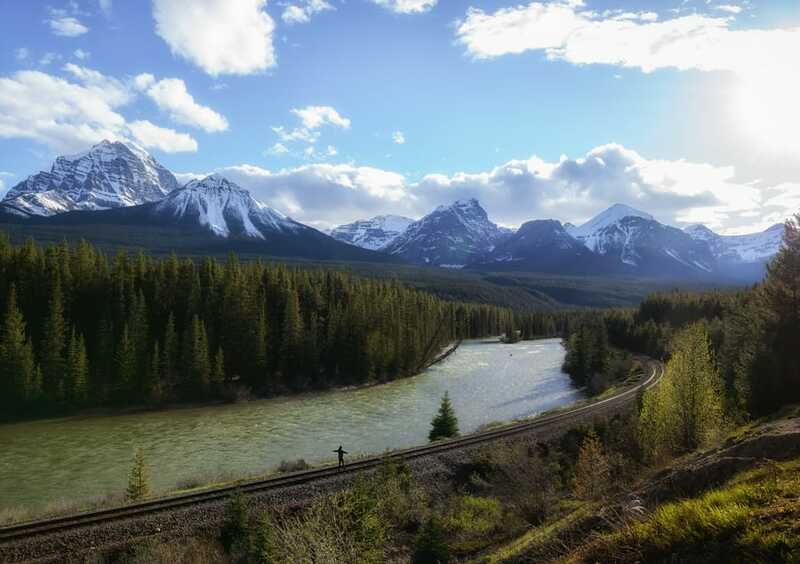 To get to this point, you must leave the Bow Valley Parkway in Castle Junction, cross the river crossing and a bridge, then you will find a fence that you can open on the right. This fence prevents animals from crossing the Trans-Canada highway, but you can enter and exit as long as you keep it closed. In fact, we later took this highway to go to the town of Lake Louise (faster than the Bow Valley Parkway) and saw our first Grizzly bear on the other side of the fence. The town of Lake Louise is closest to the touristic Lake Louise. This lake is the most visited in all the national park, so as you can imagine, most of Banff’s tourism is concentrated here. Lake Louise is smaller than Banff, but it has its own Canada Parks Information Center. In this office, you can get the Day Hike guide to Lake Louise, Castle Junction, and Icefields Parkway area. You can also find it attachedhere. 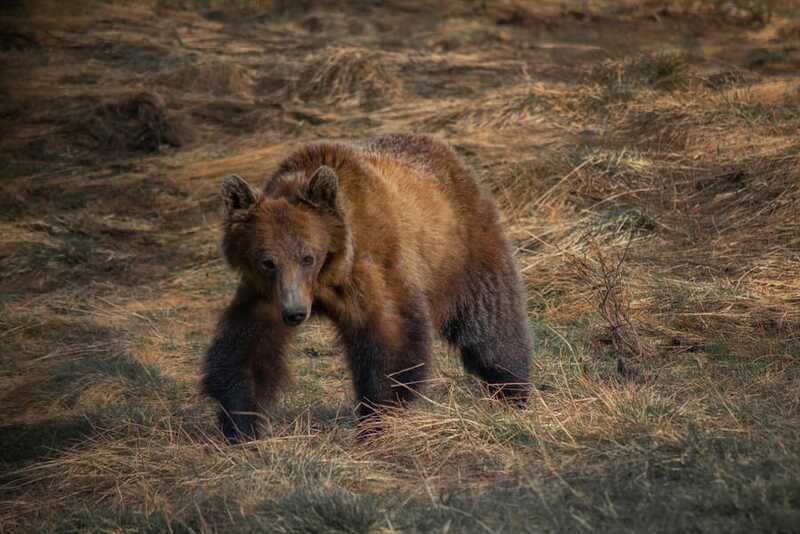 Also, you have to be especially careful in Lake Louise and surroundings, since it is one of the most active areas for Grizzlies in Banff. 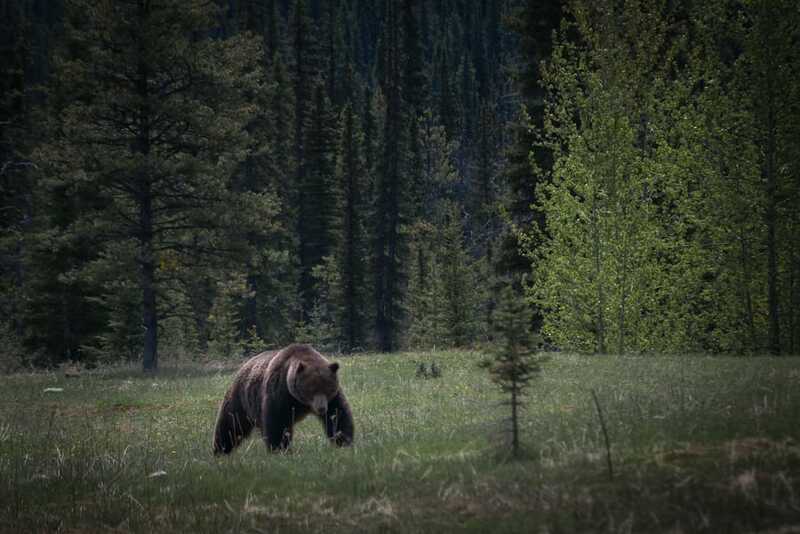 If you are interested in learning how to avoid bears attacks in Canada, you can find our article about it through this link. The Lake Louise area is located at a higher altitude than any other in Banff National Park, and when we got to this lake, we found it mostly frozen. 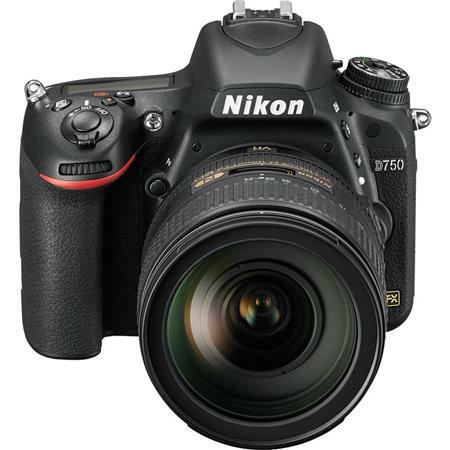 If you are visiting this area early or late in the season and want to check the conditions of the lake beforehand, there is a very useful camera you can use through this website. Even though it was still low season in May, there were a large number of tourists crowding the lake even early in the morning. In full peak season, visiting this lake could be a very stressful experience, with the imposing and misplaced Fairmont Chateau Lake Louise hotel behind. This luxury hotel is at the top of my list of constructions that should be demolished because they greatly affect the environment of this natural area. This construction was built also by the Canadian Pacific Railway to promote its train line, and was later sold to the Fairmont hotel company. With 3500 m2 and 500 rooms, it seems incredible that it can be in such a beautiful place: on the bank of Lake Louise, the mountain range, and Victoria Glacier above. From Lake Louise, you can hike to Lake Agnes, a quiet lake known for its tea house at 7004 feet (1312 feet from Lake Louise). Hiking to this cozy teahouse hidden in the mountains was one of my favorite things to do in Banff. In May, you very well may need crampons to reach the top. It was the first day that the tea house opened that year, and we were not the only ones who dared this trek despite the difficult icy conditions. Built in 1901, also by the Canadian Pacific Railway, the tea house sells homemade soup, fresh baked bread sandwiches and more than 100 different types of tea to their visitors. Remember to carry cash because cards are not accepted. Fun fact: the electricity of the tea house is created by a small generator, and the fuel, along with the different ingredients they use for drinks, are brought in by workers on foot. Halfway through the hike, we were able to see the melted part of Lake Louise that we did not see from below. From here, you could see the well-known emerald blue of its glacial waters. Before arriving at the tea house, we found Mirror Lake, much smaller and completely frozen. Once up there, we enjoyed the views under our feet, with an incredible waterfall that fills Lake Agnes. We highly recommend this hike. However, I think that the summer months (July – August) could be too crowded. 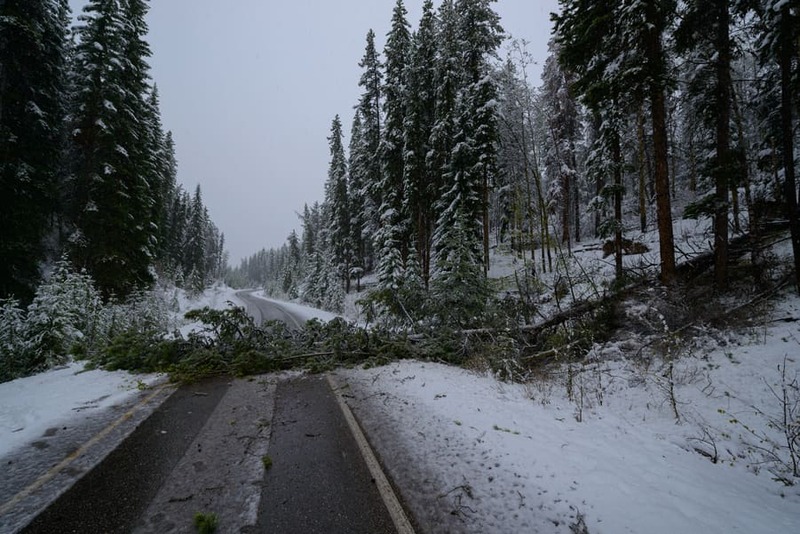 Keep in mind that some of the treks may be closed due to snow if you are visiting Banff National Park in the early season before mid-June. The Plain of Six Glaciers is one of them. This trail is situated along the path that borders Lake Agnes on the right and continues through an abrupt zigzag passing the top of Big Beehive. This trek will descend along the left half side of Lake Louise, a 9 mile loop that takes 5 hours. At the furthest point of the hike, we can find another tea house even more remote than the one in Lake Agnes, just in front of the Victoria Glacier. If you are visiting Lake Louise during the summer, hiking the Plain of Six Glaciers should definitely be on your list of things to do in Banff. 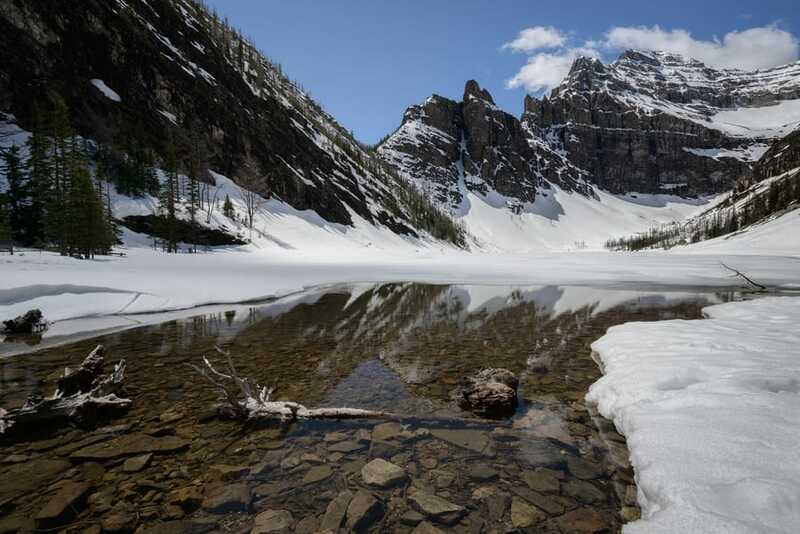 The first time we tried to go to Moraine Lake, the road was not yet open after the long winter. A thick layer of snow was keeping us from one of the most photographed lakes in the Canadian Rockies. 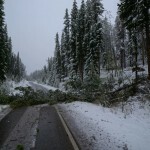 Luckily, they cleared the road the next day and we were the first to arrive. The way to the viewpoint was completely covered by a layer of snow. From here, we saw the lake for the first time, covered in snow and ice, and flanked by the majestic Ten Mountain Peaks of Moraine lake. We returned the following morning at dawn. This time we were not alone. 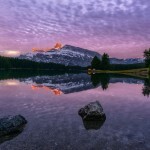 At least 10 other photographers were already waiting to take one of the most characteristic photographs of the lake when the peaks are tinted in orange by the light of the sunrise, an essential phenomenon to see in Banff. 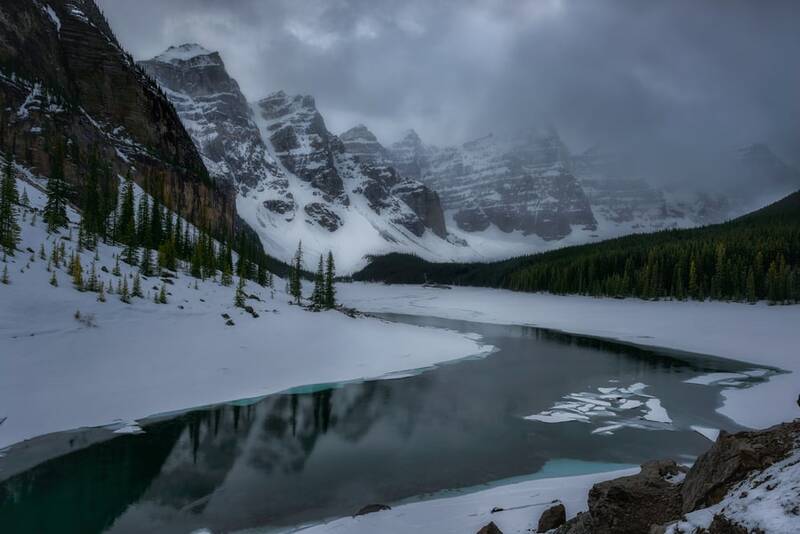 Moraine Lake is located at an altitude of 6180 feet and the weather is significantly colder than other areas of Banff and the Canadian Rockies. Remember to wear the right clothes if you are planning to shoot the sunrise since temperatures drastically drop during the night. Although it is true that we missed Moraine in its famous electric blue, we would not change this experience. 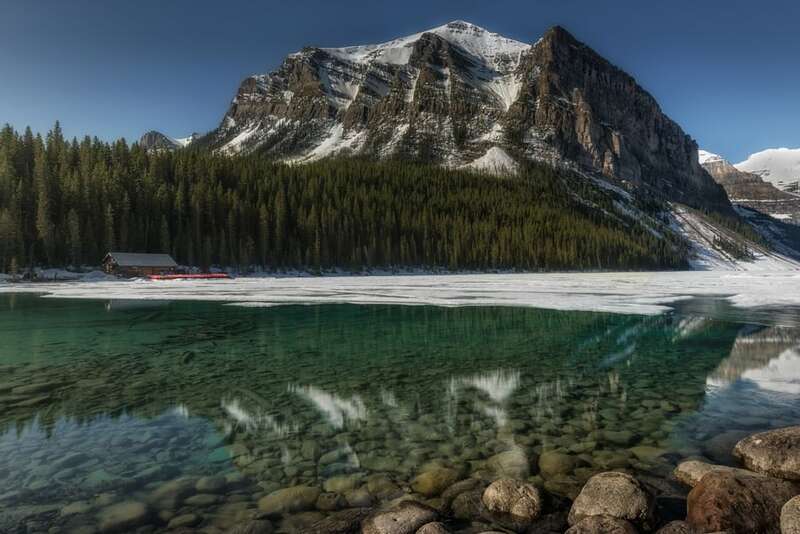 The intense blue color of this lake when it is thawing is a rare natural wonder – same goes for Lake Louise. The glaciers erode the surrounding rocks, creating dust in the form of silt. With the thawing, these sediments are dragged into to the lakes, in the so-called form of glacial milk or rock flour, giving them the iridescent blue-green colors when the sunlight strikes them. 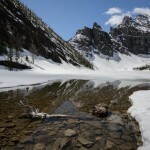 It is one of the easier treks from Moraine Lake. However, we couldn’t do this hike due to the snow. This trail takes two hours round trip, and when you reach the Consolation Lakes, you can enjoy a very beautiful alpine view. Sentinel Pass is the most popular trail around Moraine Lake. However, the freezing state of the area made it impossible to do the hike. The first part of the trek leads you through a unique larch pine forest where the most impressive views of the Ten Peaks are found. From here, the trail continues to take you through the famous Larch Valley and Paradise Valley. 3.6 mile one way and 5.5 hours round trip. They say that the Icefields Parkway is the most beautiful roads in the world and we were a hundred percent sure of this after our visit – Waterfalls, beautiful blue lakes, rivers, glaciers and ice fields. High mountain passes with year-round snowy peaks and abundant wildlife wherever you stop are some of the reasons why this is considered one of the most scenic roads on earth. This 142-mile road links Banff National Park with Jasper National Park. We suggest taking a round trip when visiting the Canadian Rockies, so you can enjoy it again on your way back. If you take this drive at the beginning of the season, you will be able to see how quickly the landscape changes in a matter of days with the thawing of many lakes and snow. 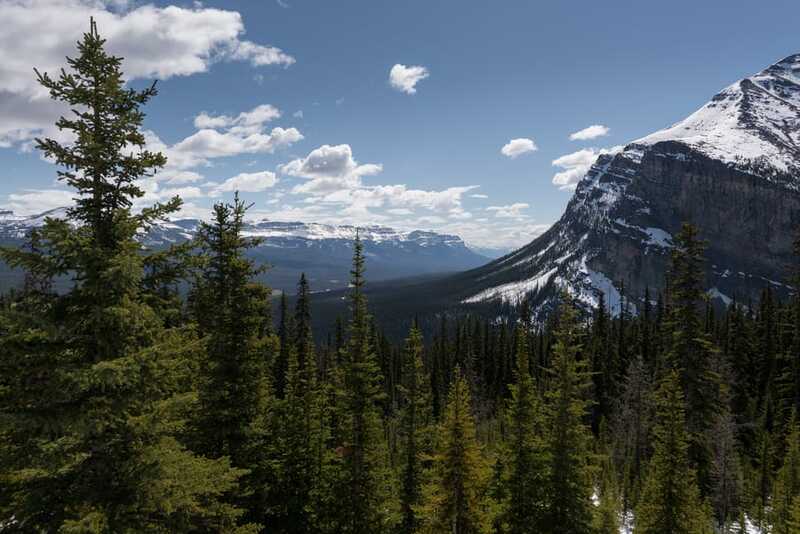 In this section, we will only talk about the points of interest along the Icefields Parkway related to Banff National Park. If you want more information about the Icefields Parkway, then do not miss this guide with exclusive content about this scenic road. 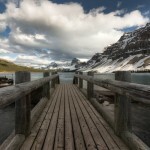 Of the dozen lakes along the Icefields Parkway, Bow Lake is a mandatory stop. This lake that is just off the main road is the perfect place to park your car and have a picnic with the surrounding views. 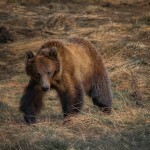 Although this area is not known for Grizzly bears sightings, we saw one just a few meters away from our car. 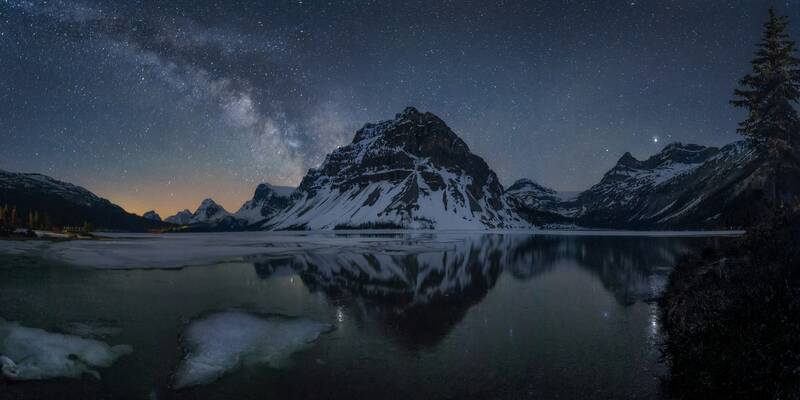 The views of this lake that we liked the most were at night, when the Milky Way crosses the Bow Summit. 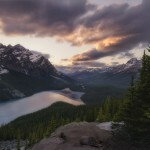 We visited Peyto Lake 4 times in total: two times during the day and two sunsets into the night. 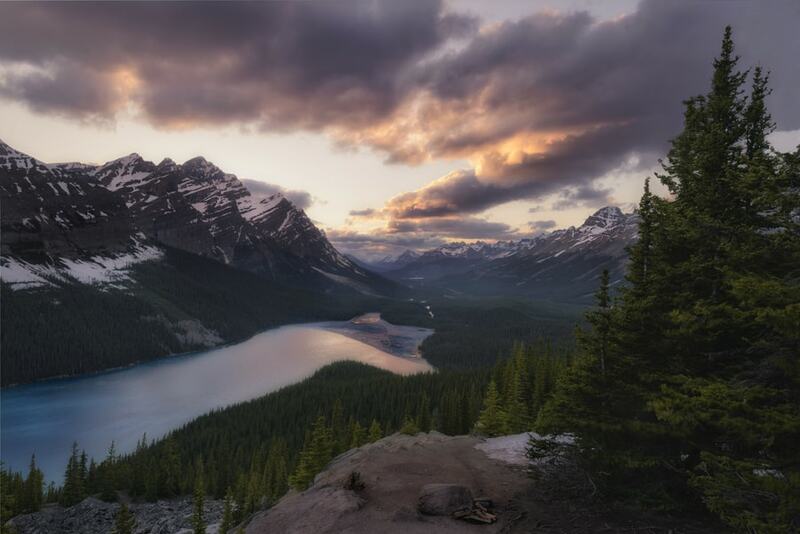 Peyto Lake catches your eye and it is undoubtedly one of the essentials you have to see in Banff. The first time we visited, it was still quite frozen, and we needed crampons to get to the main viewpoint. The trail is very simple and you should be at the lake viewpoint within 15 minutes. However, if the ground is covered with ice and snow, it can be quite complicated. In the mornings that we went to Peyto, we found a quite a few other backpackers at the viewpoint. 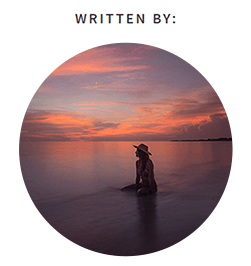 On the other hand, we were alone during sunsets. 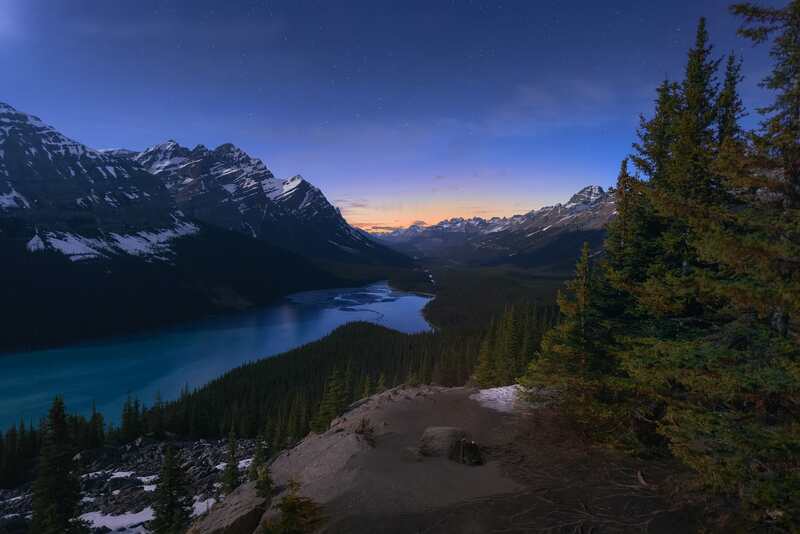 On our last night in the Canadian Rocky Mountains, we were lucky to witness the thawing of Peyto Lake, revealing its intense blue color from the glacial salts. The wolf that shapes the lake was thawing, keeping only a thin mask that ended up disappearing with the night. The memory of dining with this show and our delicious campingaz dinner is one of those moments that make us smile every single time. 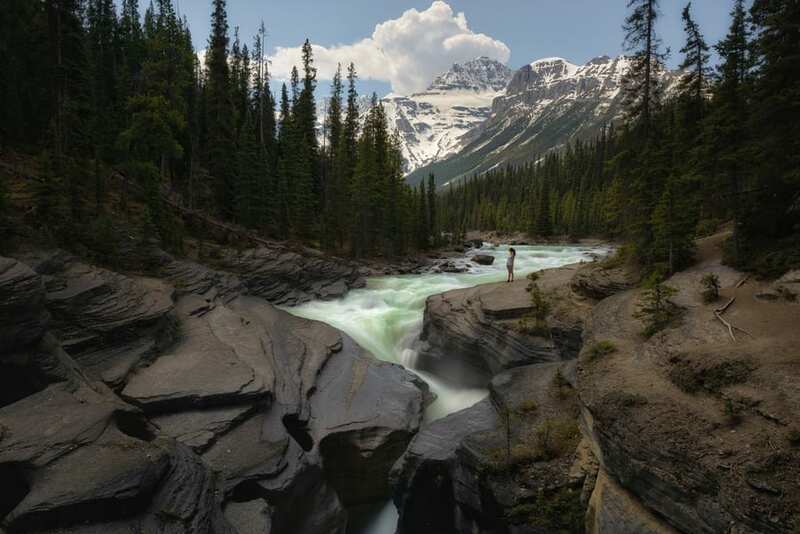 Another essential stop on your trip along the Icefields Parkway is Mistaya Canyon, only 0.3 miles away from the parking lot. It is recommended to go early in the morning to avoid crowds that occur at midday. The roar of the powerful stone carving water is amazing – the foaming water, once part of a glacier, reveals a milky blue color. As we have discussed in our 15-day Canadian Rockies trip article, we prefer to camp, and Banff National Park is the perfect place to do so with a wide variety of available campsites. Bear in mind that campsites are not open all year round. Here is the brochure of campsites in Banff National Park with opening dates. and very useful tips to consider, such as food storage methods that keep from attracting bears, regulation of bonfires, quiet hours, etc. Although they recommend booking in advance, we didn’t have any problems without a reservation while traveling at the end of May. Though we always found a free spot, most of the campsites fill up quickly during high season. If you want to ensure your spot, you can book through this link or by phone at 1-877-737-3783. Most campsites in Banff have the same services. Each spot is equipped with a table and fixed benches, a fireplace, a spot pitch your tent, and enough space to park your car. If you want to have a bonfire, there are some campsites where you pay for a special permit to do so, and they will supply the firewood. During the two days that we camped here, we explored Banff and Bow Valley Parkway. With only 72 spots, this is one of the campsites that, I recommend booking ahead if you go during high season as they sell out quickly. You can also find wooden huts in the same campsite next to the tents area. We paid only € 12 per night, but we would have paid a much higher price because camping on the shores of Two Jack Lake is priceless. The campground is small, family friendly, and equipped with hot showers. The tent sites are shaded from the sun by the tall pines in the area. Nonetheless, the best thing about camping here will be having breakfast while overlooking the lake. Right next door, the Two Jack Main Campground is a much larger but offshore campground. It is open during the high season months to accommodate overflow campers who cannot find a spot at Two Jack Lakeside. 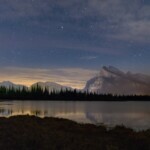 We stayed at this campsite on the last night of our trip since it was totally frozen and closed at the beginning of our trip (we had to go to the nearest open campsite in Yoho National Park). Lake Louise Campground is the ideal place to visit the Lake Louise area. The price was € 18, a little more expensive than the previous one. The campsite has a cattle grid at the entrance and is also surrounded by an electric fence in its entirety to avoid grizzly bear attacks that can be more common in this area. We were surprised about these security measures initially, as they were not found in any other camping areas in the Canadian Rockies. 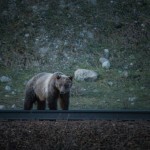 Then, we saw two grizzly bears a few meters away the next morning and realized the need. In fact, the park rangers who permanently track one of the two we spotted, arrived shortly after it was in sighting. 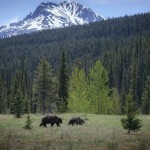 The Boss (the bear’s name), is the largest and most dominant bear in the Canadian Rockies. The Boss is so feared and admired that many articles have been written about this beast. We were very lucky to see him. In the Icefields Parkway area, we had problems with finding open campsites, so we stayed at Hi-Mosquito Creek Hostel in the end. This hostel has both private and shared rooms. We stayed in a 12-bed shared room, priced at € 28 per bed, to reduce our budget. The interesting thing about this hostel is that while it does not have showers, there is a wood-burning sauna, which we could not enjoy since we still had many things to do in Banff National Park. If you like this place, you can book here. Fairmont Banff Springs Resort is considered one of the best hotels in Banff. It was built in 1888 by the Canadian Pacific Railway to accommodate the wealthiest guests. It has 14 restaurants and 11 stores, among which include ski equipment rental. This hotel is the best for those coming to Banff in the winter for a skiing holiday since it is located very close to the slopes like Sunshine Village Ski Resort and Mount Norquay Ski Village. One of the main attractions of this hotel is its proximity to the Upper Spring, a hot spring one can enjoy throughout the year. The hours of the Banff Hot Springs are from 10 am to 11 pm. Another of the best hotels in Banff is the Banff Rocky Mountain Resort. Like the previous one, it is a luxury hotel located very close to ski slopes. The other touristy attraction that we did not visit is the Banff Gondola. This cable car takes you to an observation platform in the Sulfur mountain that features 360º views to 6 impressive mountain ranges at more than 6560 feet high. 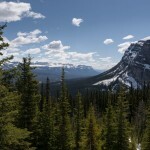 If you have not read our Canadian Rocky Mountains post yet, I recommend doing so. In that article, we included many tips regarding visa, currency, park entrance fee, and necessary luggage, etc. 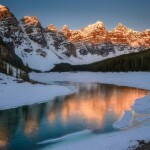 Here, we will focus on providing information about Banff Canada that complements the previous article. The best time to visit Banff is from mid-May to early October. However, keep in mind that during July and August, the main attractions in Banff will be crowded with tourists. Consider the many other things to do in Banff during summer. If you come at the beginning of the season and don’t want your fun to be ruined by closed treks or frozen lakes, I recommend leaving the Lake Louise area and Icefields Parkway toward the end of your trip, giving summer a few more days (which are significant) to do its job. 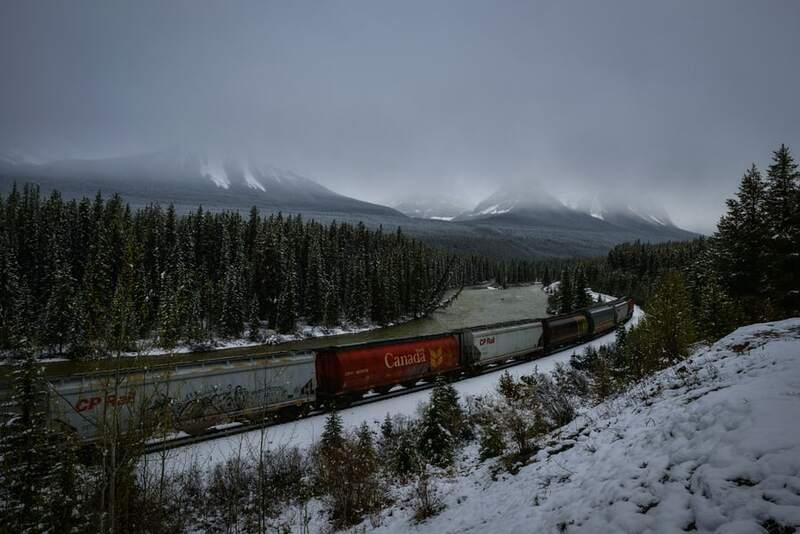 If you plan to visit Jasper National Park as well, I would advise going there first and then backtrack to Banff, since melting takes place later in this area. If you travel between October and May, there are also many things to do in Banff during winter, especially if you enjoy winter sports. SUMMING UP, WHEN TO VISIT BANFF NATIONAL PARK? July and August: All the roads in Banff will be open, but there will be many tourists, the accommodations will run out quickly and the prices increase. 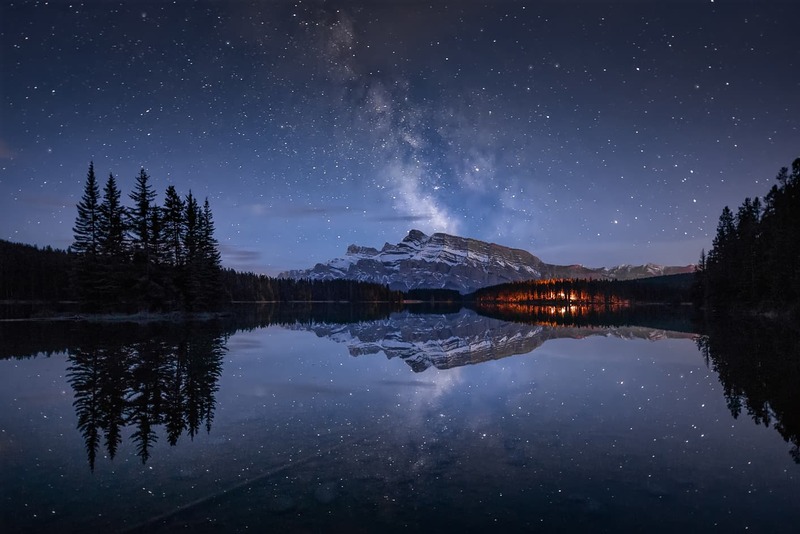 June and September: There is already a lot of tourism in Banff, although not as much as in the previous months and depending on the year, there may be areas that are close but it is not usual. May and October: There won’t be many people in Banff but we are totally dependent on the weather. There are years that the weather is very good on these month and others that it is very bad. November, December, January, February, and March: Best months to do winter sports in Banff. We spent 6 days in Banff and found it to be perfect for a 15-day Canadian Rockies trip itinerary. However, if you travel to Banff in the summer when most of the hikes are available, I would suggest to visit Banff for 1 week. If you want to take a tour to Banff and Jasper, plan to spend a minimum of 8 days between the two national parks. The Banff National Park is one of the most touristy parks in Canada, so it is increasingly difficult to see animals. 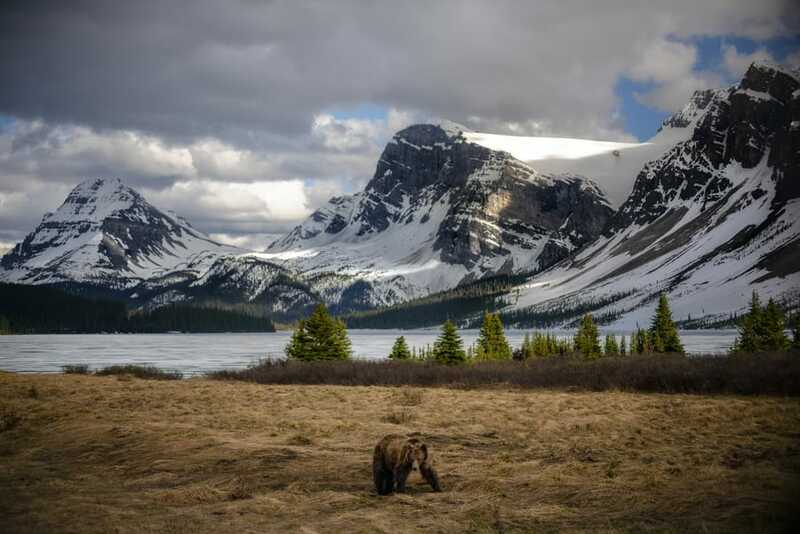 The best way to watch wildlife in Banff is by driving through the Bow Valley Parkway and the Icefields Parkway at sunrise and especially at sunset. 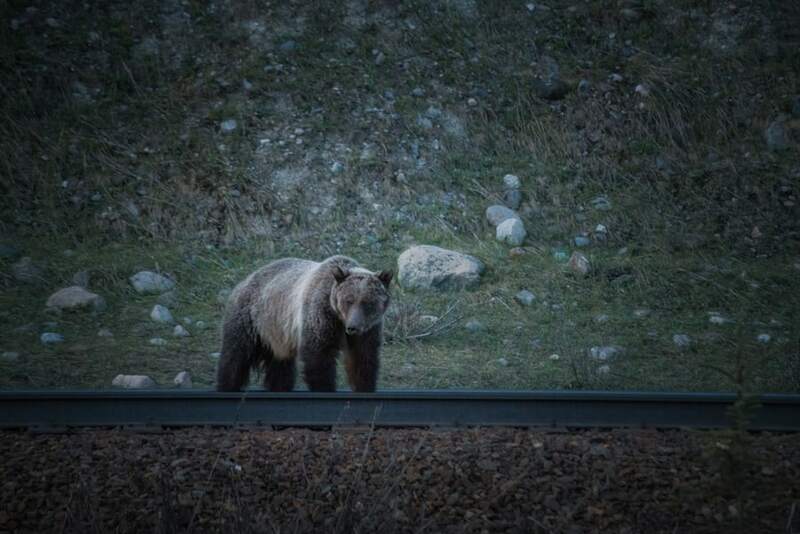 It will also increase your chances for wildlife spotting in Banff by visiting the area early in the season when animals start getting out in spring and when there are fewer tourists. 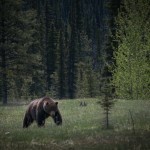 Here is our article about some of the animals you might see during your trip in Banff. 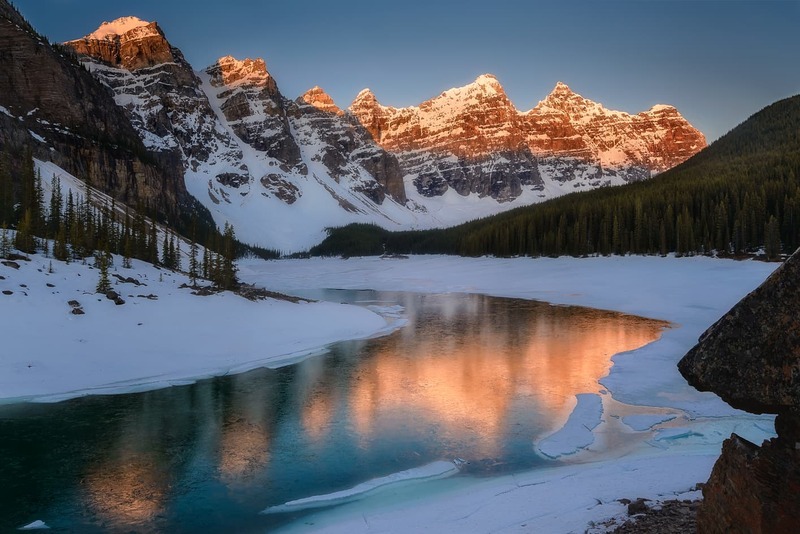 The Rocky Mountains is an increasingly popular tourist destination with many travel agencies offering tour packages to Banff Canada. It is not necessary to hire a tour as it is relatively easy to visit Banff on your own. 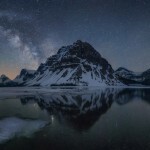 The only exception that interested us are the Banff and Jasper photo tour packages where a guide takes you to the best locations whilst helping you capture all the magic of the Canadian Rockies. To finish this guide of things to do in Banff, we attached a map where you can find all the places of interest mentioned in the article marked below. We also made the KML file of the map available in case you want to use it offline. 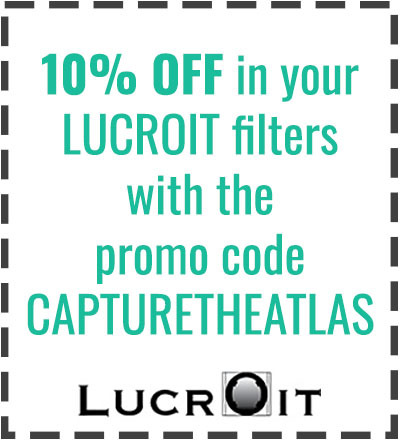 Simply click on this icon to download and follow the steps mentioned above. SEE YOU IN THE NEXT ARTICLE AND DO NOT HESITATE TO LEAVE US A COMMENT IF YOU NEED MORE INFORMATION ABOUT BANFF.